Liverpool’s Cavern Club is the cradle of British pop music. Impressively, 60 years after its foundation, it survives and thrives as a contemporary music venue. Through seven eventful decades, before, during and after The Beatles this legendary cellar has seen its share of setbacks yet has played a role in each epoch of music, from 1950s jazz to 21st century indie rock. 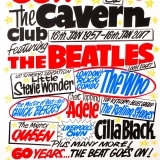 Take a look at the Cavern’s rollercoaster ride through the decades and discover how it survived the setbacks and closures to become the most famous music club in the world!